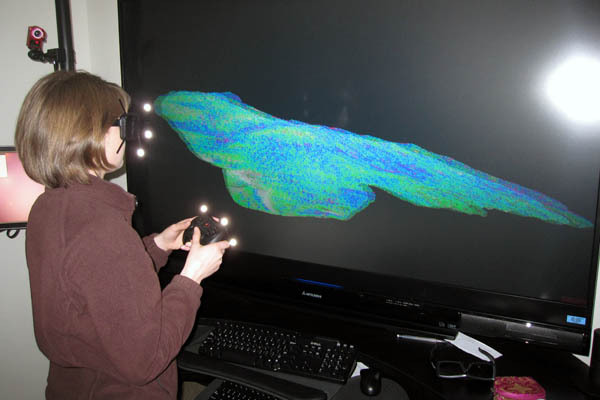 3D system resulting from a collaboration between Idaho Universities and the Idaho National Laboratory (INL), scientists can explore multiple dimensions of data that, until now, could only be viewed two dimensionally. A traditional IQ-Station (also known as CAVE™) is housed in a room with projectors displaying images on all surfaces, while cameras are used to track the movements of the user. The user wears 3D glasses and operates a controller to view and interact with data in a 3D immersive environment. ISU’s IQ-Station displays images on a large screen instead of on the walls. The user can interact and manipulate the data across a volume or area projected on the screen. IQ-Stations are portable and less expensive than full CAVE™ systems, and can be useful in many applications where full-featured CAVE™ systems are not needed. The IQ-Station at ISU BCAL features a 3D 73-inch Mitsubishi LCD display and optical tracking system by NaturalPoint and relies on a high end computer to run Vrui, a virtual reality software developed by UC Davis that performs the 3-D rendering. In addition to remote sensing data, MRI and CT scans (medical imaging), CAD drawings (engineering), and complex molecular diagrams (chemistry) can also be visualized in the IQ-Station for scientific interaction. The IQ-Station at ISU BCAL is currently being used for several research projects. These include a multi-temporal study of an active landslide located in the Salmon Falls area 16 miles south of Hagerman, ID, and a line of sight study to aid visual studies under forest canopies for artificial intelligence and landscape modeling. INL has also donated IQ-Stations to Boise State University and University of Idaho.